A new analysis by the Rights and Resources Initiative (RRI), Woods Hole Research Center (WHRC), and World Resources Institute (WRI) found that Indigenous Peoples’ and local communities’ contributions to climate change mitigation are far greater than previously realized. 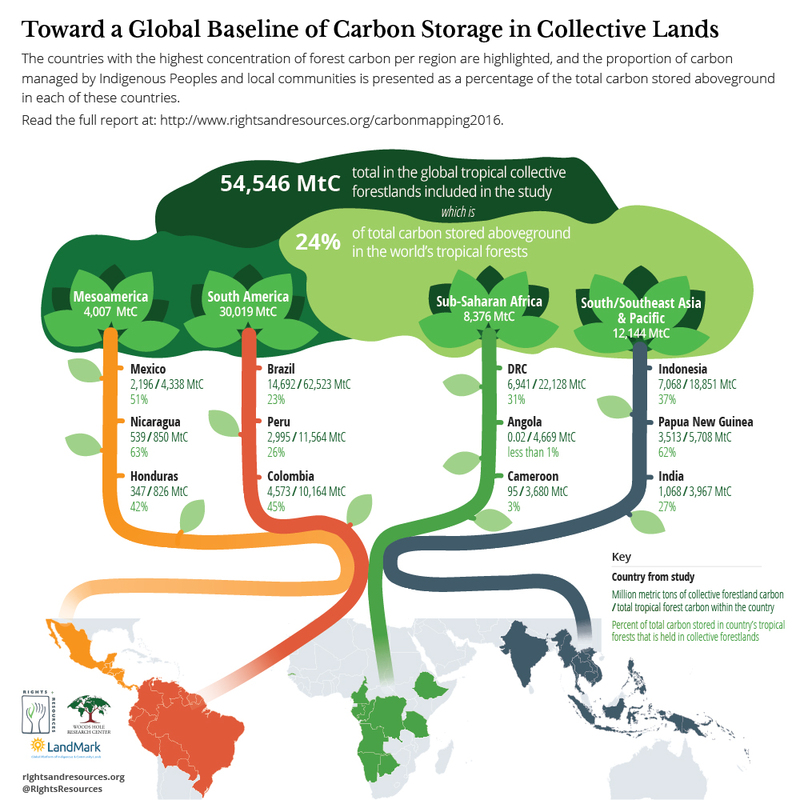 Indigenous and community forestlands hold almost one quarter of all above-ground tropical forest carbon, the equivalent of four times the total global carbon emissions in 2014. One tenth of the carbon stored in tropical forests is in community forests that lack formal, legal recognition. Without secure rights, local peoples and their forests are at risk: communities may unjustly lose their lands, and forests may be destroyed. These figures rely on conservative estimates that only include documented community-managed forests in the tropics; the full extent is assumed to be much larger, as communities and Indigenous Peoples claim more than 50 percent of the world’s land but only have legally ownership rights over 10 percent. As the Marrakech Climate Change Conference approaches, this study reinforces the urgent need to make collective tenure security a critical part of national emission reductions strategies.